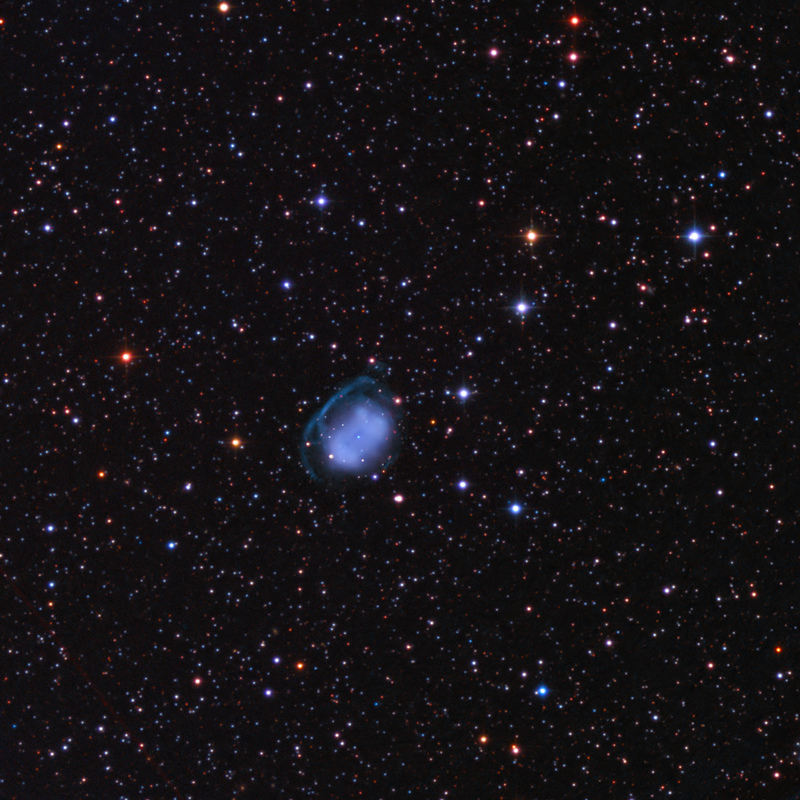 Abell 65 (PN G017.3-21.9) is a 2′ long planetary nebula in Sagittarius that is rarely imaged. In the image above North is up and East is to the left, so the orientation of the nebula is northwest-southeast. OIII and Ha + [NII] narrowband filters were used to bring out the structure of the inner and outer nebulae, and RGB data were added for star colors. The field is 25′ x 25′. Its distance has been estimated by Frew (2008) to be about 3,800 light years. It has been studied and modeled by L. Huckvale et al. (2013) (http://arxiv.org/abs/1306.4272) (MNRAS, Sept 11, 2013, 434 , 1505-1512), who conclude it to be a double-shelled planetary nebula with a binary central star. Bond and Livio (1990) report an orbital period of 1 day for the binary, which Shimansky et al (2009) show it to be a precataclysmic variable. Huckvale et al. find that the inner (bright) nebula and the outer shell nebula (shown by arcs in my image above) are inclined similarly (within error) at about 68 degrees from our line of sight. Their modeling suggested that the inner and outer bipolar nebulae of Abell 65 occurred about 7,000 years apart in the evolution of the binary central star. 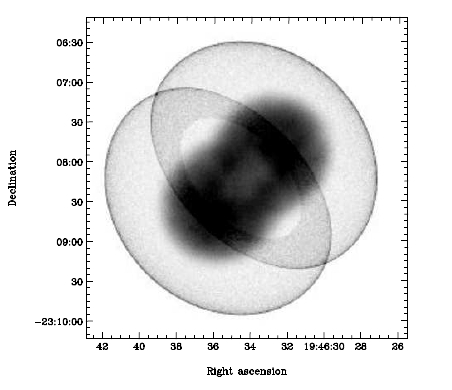 A graphical representation from their modeling of the structure of Abell 65 is reproduced below. They claim that Abell 65 is the first planetary nebula with a known binary central star that has a double shell. There is more and more evidence that bipolar morphologies of planetary nebula arise from binary central stars with outflows perpendicular to their orbital planes.